Steffanie Munguia was named a Hollings Scholar. 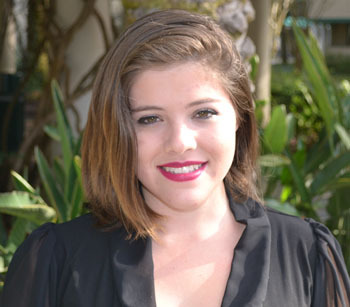 TAMPA, Fla. -- A University of South Florida College of Arts and Sciences student was named a Hollings Scholar by the National Oceanic and Atmospheric Administration (NOAA) for 2013-15. Steffanie Munguia will receive $8,000 per year for two years for academic assistance and a 10-week, full-time paid internship position during the summer at a NOAA facility. Munguia is an Honors College sophomore majoring in integrative animal biology and minoring in environmental policy with a 3.91 GPA. She is currently an undergraduate researcher for Lynn Martin, Ph.D. of the Department of Integrative Biology, where she is developing a project to investigate behavioral thermoregulation in two anole species found in Florida. Munguia also is working on developing a database of bird hormone investigations with Martin. Munguia, who would like to pursue a Ph.D. in behavioral ecology, was selected for a National Science Foundation Research Experience for Undergraduates in summer of 2013 where she studied with Alice Boyle, Ph.D. of Kansas State University. In the future, Munguia will continue conducting ecological research focusing on how climate change is affecting our wildlife populations and the ecology of our most fragile ecosystems. She hopes her research will unearth a deeper understanding of how human activities may precipitate declines in native populations, as well as provide solutions to keep our ecosystems healthy. The aim of her research is to benefit our understanding of ecosystem functions and make a difference in how we view and treat our natural world. ?? "Steffanie's commitment to research will have tremendous impacts in the future,” said Linda Lucas, director of the USF Office of National Scholarships at USF. “This recognition by NOAA will enable her to continue her research agenda." The Hollings Scholarship Program provides successful undergraduate applicants with awards that include academic assistance for full-time study during the 9-month academic year; a 10-week, full-time internship position during the summer at a NOAA facility; and, if reappointed, academic assistance for full-time study during a second 9-month academic year. The internship between the first and second years of the award provides the Scholars with "hands-on" and practical educational training experience in NOAA-related science, research, technology, policy, management and education activities. Awards also include travel funds to attend a mandatory NOAA Scholarship Program orientation, conferences where students present a paper or poster, and a housing subsidy for scholars who do not reside at home during the summer internship.